Dance Of The Vampires - A rocking "horror musical," grandly staged, fabulously choreographed. In short : A Great Show! The orchestra and the singers produce CD quality sound, while technology produces dream factories. Staged fairy tales on fairy tale stages. The same applies to the music. Jim Steinman, the inventor of Meat Loaf and Bonnie Tyler, has also composed in accordance with the unwritten "rule of Webber." His Total Eclipse Of The Heart is, as Steinman's own signature, the hit song in Dance Of The Vampires...a complete three hour composition, a soundtrack illusion merging rock, pop and Puccini. Dance Of The Vampires is a true audience pleaser...Our total impression of Dance Of The Vampires is so overwhelming because every detail fits. The scenery, the polished choreography, the outstanding music, the magnificent costumes. Anyone who likes musicals and the perfect illusion will find that Stuttgart is his Mecca. Dance Of The Vampires is simply a great show. The bite that leads to immortality! Every emotion is packed into this production, and even humor isn't left out...The song Total Eclipse from rock singer Bonnie Tyler reappears throughout the entire piece. Composer Jim Steinman has succeeded in cleverly combining the rock 'n' roll touch with classical music. Director Roman Polanski is well aware of what he has found in Jim Steinman: "We should consider ourselves lucky that Jim took on this project." The musical Dance Of The Vampires is undoubtedly capable of maneuvering the stranded ship Stella into calm and successful water. The attractive mixture of droll comedy, theatrical prose, parodied kitsch and festive dance scenes is successful! This energetic, spirited and humor-filled product is tremendously entertaining...The "Richard Wagner Of Rock," composer Jim Steinman, has reached deep into his box of musical tricks and come up with a gripping and successful mixture of his sound and that of others. Total Eclipse Of The Heart is back, and then there's vehement and loud rock music, soft ballads and finally, as if to say that everyone has already given their blood, the production ends with a fast disco number...With the breathtaking perfection of Roman Polanski's direction, our blood cells continue to laugh, as love and lust prevail. Down the staircase to the ball of the undead! Stella is back! 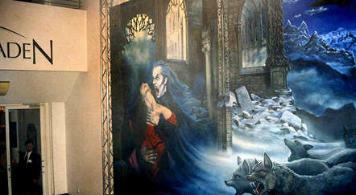 With it's thundering sound, attractive directorial ideas, and fantastic sets, the Dance Of The Vampires is far superior to previous productions in Stuttgart...Jim Steinman's music is precious...The mix of styles, ranging for Bonnie Tyler through baroque harpsichord collages of love songs...to loud rock music is effectively put together. This certainly offers excellent entertainment! A cult musical has arrived! The extravagant costumes and decors, the prefect technology and the amplified sound achieve the desired effect...The success of this production is due in large part to the efforts of choreographer Dennis Callahan. It's most impressive elements include the rapid scene changes of William Dudley's fantastic and fantasy-filled, enchanting, magical and fairy-tale-like sets, as well as its skilled modern lighting direction...The performance of the ballet ensemble, which has essentially created modern dance theater, is also impressive. The soloists distinguish themselves with beautiful voices and lyrics that are also comical in places. Roman Polanski has directed a successful replacement for Stella's production of Miss Saigon. 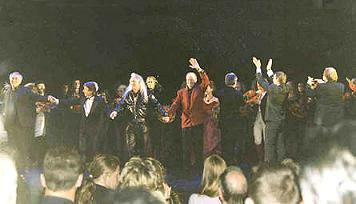 The direction of Roman Polanski and the music of Jim Steinman was celebrated with standing ovations! Gruesomely beautiful! Our prognosis? Vampire Krolock will easily outlive his neighbor, The Beast, who has been dancing across the stage with Beauty since December, 1997. The musical does not impress with mere biting gags, but with a mouthful of power...This musical is certain to appeal to younger audiences, thanks to the terrific second act. It begins with a fabulously choreographed nightmare and ends with a dance of the vampires that is a parade of sorts. View Of The Region - Survey...How did you like Dance Of The Vampires? One thousand eight hundred journalists, travel agents, and many others who had bid for tickets, attended a preview of Dance Of The Vampires. Here are a few of their initial reactions. "Very, very good. Outstanding costumes, excellent scenery, great music. The staging of the piece was also very successful in terms of content. 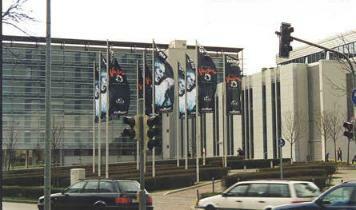 The audience felt it was outstanding...I would not have expected such perfection here in Stuttgart after Stella went into bankruptcy. I am, however, convinced that this production will enable Stella's new owner, Peter Schwenkow, to revive the company. He'll do it." "It's really wonderful; the artists, the music, the staging, simply everything. It will certainly not be difficult to market this piece on an international scale. This is something we are already working on, and now that I've seen the production I know my work will be easier..."
"We liked it very much. Every detail is just right, such as the synchronized dance in front of the mirror. The frequently changing sets are impressive, the music is very well arranged, and I'm sure that the Bonnie Tyler song will turn into a very catchy tune indeed...Dance Of The Vampires is catchier than Beauty And The Beast..."
"Grandiose, bombastic. Sometimes it's hard not to miss the Meat Loaf sound of composer Jim Steinman. The production offers plenty of surprise effects and the audience is very effectively drawn into the action on the stage..."